An easy to follow guide for parents. Is My Child Ready for School? is a guide for parents on all things school. Based on current research on brain development and insights from many years of teaching, it examines many aspects of development related to learning. 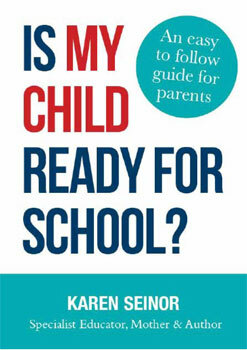 Whilst based on theory, there are practical and simple suggestions to help parents make the important decision about when to start school and what skills and knowledge are required. It also provides tips on selecting a school, how to make a smooth and successful transition to school and, how to support your child in their first year of learning. Is My Child Ready For School? An easy to follow guide for parents. Question: How far in advance do parents need to think about their children's school? Karen Seinor: If you are attending your local public school, or Catholic school usually 12 months in advance is enough as enrolments generally occur around May the year prior. If you are considering a private school you may need to enroll earlier depending on the school's enrolment process and waiting list. If your child has special needs I would recommend contacting your preferred school or schools 18months in advance to ensure they have the right programs and facilities in place to support your child. It also gives the school time apply for funding for your child to support them further. Question: What advice do you have for parents when selecting the right school for their child? extracurricular activities, are they optional or compulsory? If you child has a disability, additional needs or is gifted and talented you may need to look for a school that caters for their unique needs, don't overlook your local public or Catholic school because generally speaking the school that is the most inclusive and welcoming is probably the best school for your child. Question: How can parents ensure a smooth transition to school from Kindergarten? don't attempt to teach them with formal activities such as worksheets or flashcards, you will probably turn them off school or learning and there is no long term benefit anyway! Question: What changes in behaviour should a parent expect when their child begins primary school? Karen Seinor: Starting school is mentally and emotionally tiring for children, they will often come home exhausted at the end of the day so expect a little bit of grumpiness at school pick up especially in the early weeks until they have adapted to the hectic schedule of school. Some children may experience separation anxiety and that can manifest in a number of ways such as outbursts, refusal to get dressed, crying or clingy behaviour. A good orientation program can greatly minimise separation anxiety. Remember these behaviours are completely normal and not a result of your parenting. The best thing you can do is be a loving support for your child and you will find that most behaviours settle after the first few weeks of school but be mindful that they may creep back after holidays too. If you notice huge changes in behaviour such as big mood swings, anxiety or withdrawn behaviour that don't improve after a few weeks of school it might be time to investigate a little deeper, a good place to start is with the classroom teacher.